I was super excited to receive an email last week from my friend at More Than a Cupcake. 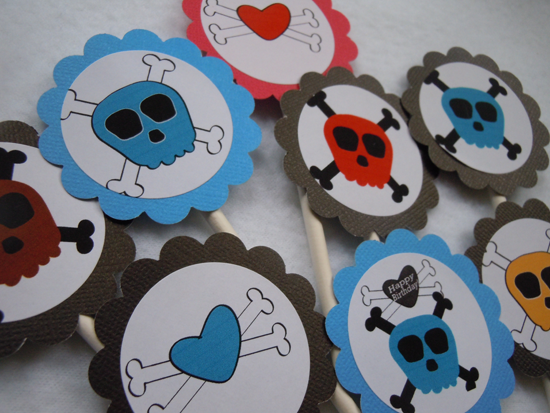 She created cupcake toppers using my Boyish Skulls and Crossbones clipart graphics. I love how she layered the designs onto colored card stock. Too cute! As a reminder, if you've created something with my clipart or digital papers and want to show it off, you can email the photos to me at showitoff@erinbradleydesigns.com. The photos need to be at least 600 pixels wide and saved at 300 dpi. I love to see what you've made! And f you want to visit More Than a Cupcake you can find their etsy shop here and facebook page here. They have super cute cupcake topper designs and are even branching out into invites.